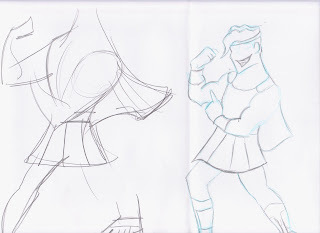 Todays lesson was looking at shapes and styles within characters that we see in cartoons. Although we don't see triangles, squares and circles within characters consciously all the time they are there constantly to give us feelings about the character we are seeing. Triangles emit fast, sharp and dangerous characteristics. These shapes don't exactly fit into the characters proportions but fit closely when defining what type of character the person or creature is that is created. Now our task within the lesson was by looking at an iconic character figure out their body shapes and then twist them to make them look slightly different and give off a different characteristic. My character was Jafar from the Aladdin Disney film. As you can see he is mainly made up of triangles, even his staff fitting into a triangle shape at the head of the snake. 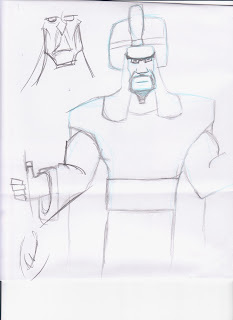 My idea was to make him more rectangular - muscular and broad. I found the exercise in class to be rather difficult today as I couldn't get the hang of changing a character without it looking wrong to me. 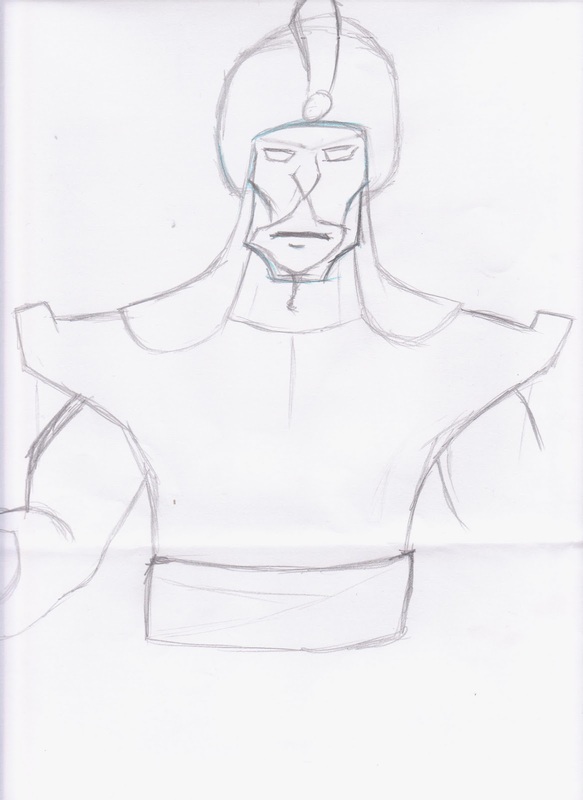 This is the first attempt and when Justin came round to inspect and chat to me about it he said that in terms of the idea it worked but I had changed the facial features of Jafar too much and therefore it didn't look like him anymore. In the top left of the image Justin showed me an idea of what a muscular Jafar's head would look like. I then made another attempt which I think was a little bit more successfull. 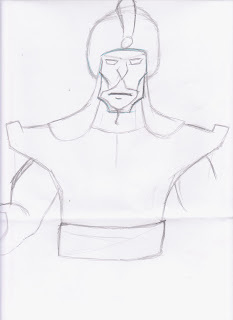 This effort looks a lot more like Jafar but I still felt like I struggled in this exercise. I feel something to take away from these classes is that I need to practice my pencil skills, I need to be sharper and more expressive which is something I need to address to make my drawings look better. 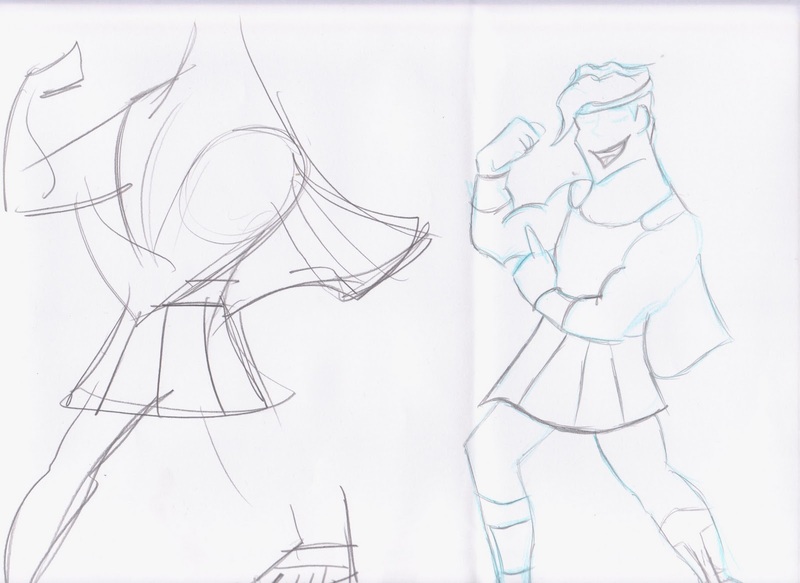 My final image is of Hercules again from the Disney film. I was attempting to make the character a little more simplistic much like the characters from the Kim Possible series but I found it quite hard and the character turned out much the same unforunately. Next to my drawing is Justin's thoughts on how it may look which was a good help to make me understand better. For my character design project I am going to need to work on my pencil skills in order to create more expressive drawings. And I need to explore character design styles much more to understand them and make sure I use them effectively in the the tone that I am trying to create for my 80's cartoon reboot.